Introducing Moto G: An Exceptional Phone At An Exceptional Price Now available in India. -5MP back camera 1.3MP front camera. -color: black, white, dark and light blue, pink, yellow and red. That’s because price-conscious consumers who don’t want to pay 20,000-50,000 or more for high-end smartphones have been left with two bad options. The first is to buy cheap, new smartphones made with second-rate technology that don’t do justice to modern apps and experiences like navigation, video chat and games. The second is to buy “low cost” versions of premium products that were released two or three years ago and are already obsolete. Under the hood of the Motorola Moto G ticks a Snapdragon 400 chipset with a quad-core 1.2GHz Cortex-A7 processor, Adreno 305 GPU and 1GB of RAM. Sadly, it doesn't run the latest Android 4.4 KitKat version out of the box, but comes with Android 4.3 Jelly Bean. 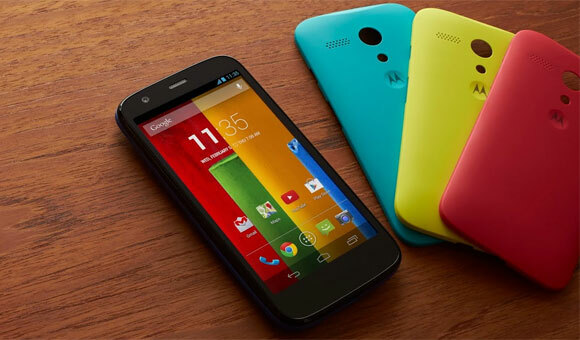 Motorola states the Moto G will get Android 4.4 KitKat in January 2014. The main camera is at the back of the Moto G and is a 5MP shooter that does only 720p video recording. Below it sits an LED flash, while on its left is the phone's speaker. The secondary front-facing shooter is 1.3MP. Motorola boasts that it has obsessively worked on the software side of the Moto G so that it's faster in answering and making calls and booting up. In fact, it says the phone is faster than the Galaxy S4 when it comes to those basic tasks. The Motorola Moto G also packs FM Radio. Below the curved back cover lies a 1,950mAh Li-Ion battery. Motorola boasts an all-day long battery life. Compared to the iPhone 5s, Motorola says the Moto G flaunts a 30% longer talk time. Internal storage is just 8GB or 16GB with no microSD card expansion option. The Motorola Moto G comes with an attractive $179 price tag for the 8GB version, while the 16GB variant costs $20 more. The phone launches today in Brazil and parts of Europe and will also be available in a dual-SIM variant. Motorola plans to launch the phone in a total of 30 countries, including the US and on 60 different carriers by the beginning of 2014. The back of the Moto G is removable and Motorola provides a variety of colored backs including black, white, dark and light blue, pink, yellow and red. Other accessories include flip covers and colored protective cases in addition to JBL wireless speakers.